The like new quality of Genuine Subaru Remanufactured Parts sets Subaru apart from the many shabby aftermarket imitations. At Shingle Springs Subaru, we're proud to install Genuine Subaru Remanufactured Parts when your vehicle requires a replacement part because Genuine Subaru Remanufactured Parts are engineered to meet original specifications, performing at the same high standards of new parts but providing incredible value because they're produced from a pre-existing core part rather than new raw materials. Also, speak with a representative at Shingle Springs Subaru to learn about the Genuine Subaru Parts Limited Warranty, which covers Genuine Subaru Remanufactured Parts. While the differences between the many aftermarket rebuilt parts are negligible, the differences between an aftermarket rebuilt part and a Genuine Subaru Remanufactured Part is demonstrable. Whereas Genuine Subaru Remanufactured Parts are deconstructed, tested, quality assured, and held to the OEM standards that uphold Subaru reliability, other rebuilt parts don't have to stand up to the original manufacturer requirements. The Subaru remanufacture process depends on the "core", which is the actual worn-out part to be replaced. The core, then, is deconstructed, each component is serviced or replaced as needed. Reassembling the core includes quality tests at each step, the same tests that new Subaru parts go through before they are installed. After full reassembly, the part is only acceptable if it matches the original standards of new Genuine Subaru Parts. 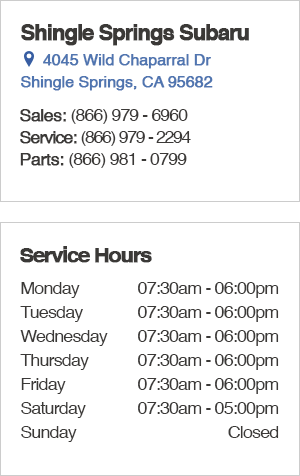 Visit Shingle Springs Subaru to have your worn out parts replaced with Genuine Subaru Remanufactured Parts.